Gaming industries are one of the evergreen industries that evolve and stays in our life. Now we don’t need to visit arcade centers and purchase coins to play a game. With the latest high-end processors like Snapdragon and Apple’s mobile chips, we can play high-end graphics games on our mobile. 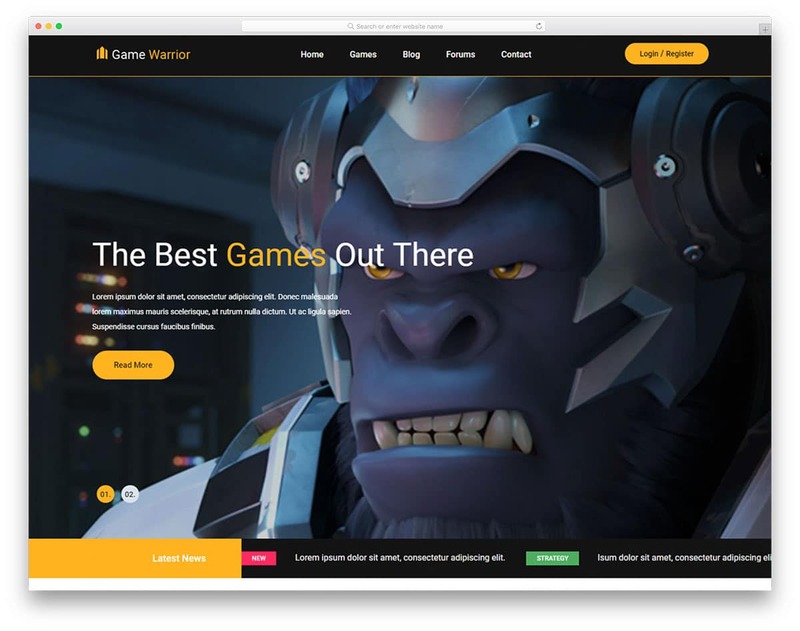 If you are about to start a website for a 2.5 billion video gamers all over the world, these free gaming website templates will be your starting point. Games have evolved a lot from the Pacman to the Fortnite and the PUBG. Gamers all over the world can compete with each other simultaneously. As augmentation reality is raising in the gaming industry we will see more interactive AR games. In Apple WWDC 2018, you might have seen multiple-player interact with each other in the same AR environment simultaneously. When you are thinking of Virtual Reality, it’s a whole different world which will reach the general public in a few years. As you can see, the gaming industry is adopting top-notch technologies to keep their gamers entertained. Your gaming website must also have the trending web design and features to meet user needs. 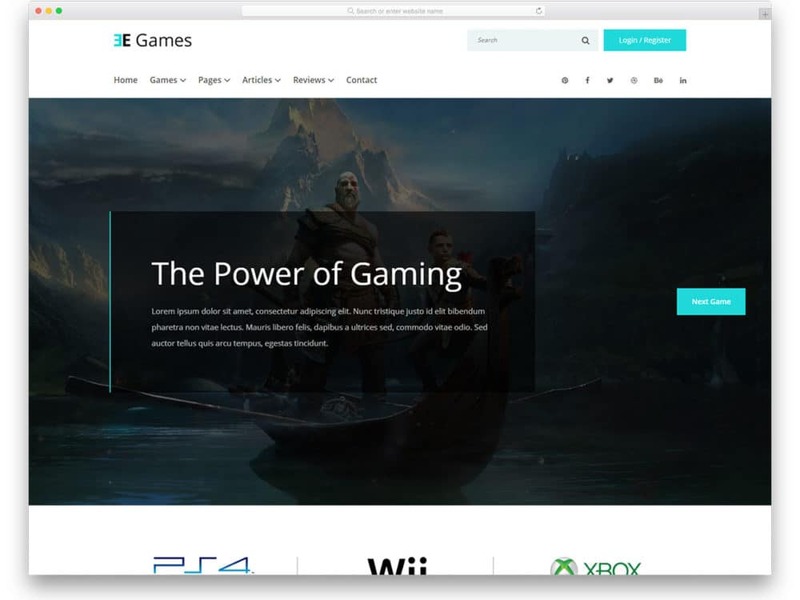 These free gaming website template will help you make an interactive website for your users. With these free gaming website templates, you can make a news website for games, game review website or walkthrough videos collection. Whatever be your need, the templates in this list will help you create a wonderful gaming website. 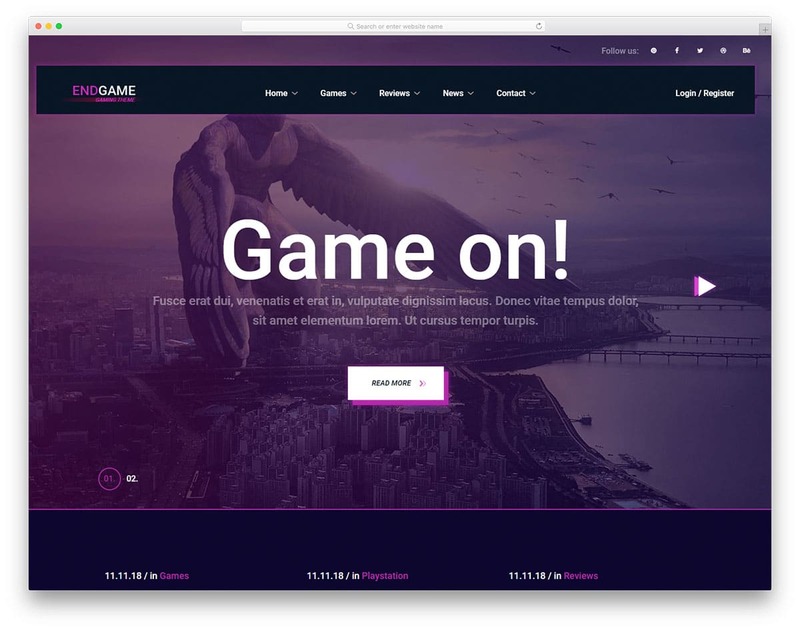 The gaming industry is one of the promising industry of worth $90 billion by 2020, so we have also added business website templates in this list for gaming companies. 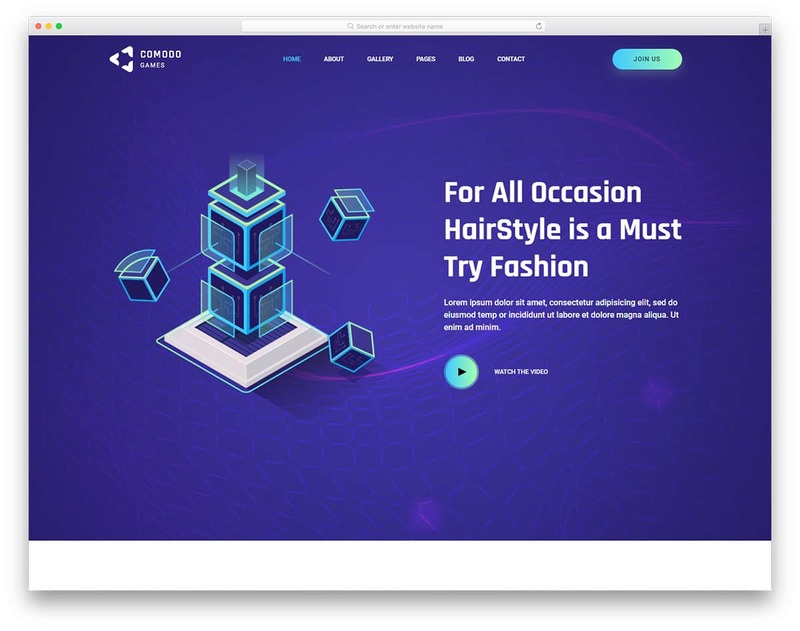 Comodo is a colorful website template with a futuristic design which designers will love for sure. The modern frameworks help the creator of the template to bring the creative design elements to life. This website template can be used for both gaming companies and game related blogs and archive websites. Tabs and content blocks are used to organize the contents properly. In the top navigation bar, you have the option to add user registration call to action buttons. The login forms and registration forms are not given in this template, but we got you covered. Check out our free login form templates with cool designs to integrate into your website in no time. Separate pages for gallery and games are given in this template; which you can use to list all your games and give a sneak peek of your upcoming games. Video contents are must-have elements on a gaming website. The designer of the template has given you more than enough spaces to add your game walkthrough videos and game trailers. eGames website template is designed by knowing the needs of the gaming audience. Lots of user-friendly features are included in this template to retain the users. This website template can be used for gaming company websites and community website which shares game updates and tips. If you are mainly preparing videos related game walkthroughs and tips, this template is the best option for you. Plus there are spaces for you to add promotional contents to help you easily monetize your website. Both light and dark colors are used in this template to easily highlight the important web elements. If you are planning to start a community for your gamers, take a look at our dashboard template collection to manage multiple users simultaneously. Plenty of subpages are pre-designed for you so you no need to worry about adding extra pages. Other useful elements in this template are rating elements and proper post section to clearly review a game or a console. Game Warrior is almost similar to the eGames template mentioned above. Since both the templates are from the same creator, you can see some design similarities at some parts. But, this template has its own unique layout and features. This template is purely designed for gaming blogs and game review websites. Lots of elements like tags and rating badges are used to easily get user attention to the new articles. At the top bar, you have a flash news widget to keep the user updated about new events and posts. A clean white background is used in this template so that the texts and the images are clearly visible. Since it is an HTML5 template, you can easily add video contents into it. The footer section is designed properly to engage with the users with the latest articles and top comments. Endgam is a properly designed website template for game review websites. With this template, you can share the latest game news and reviews with your audience. Throughout the template, the designer has followed a dark color theme. On this dark color theme, the images and the texts are clearly legible. In between sections you have space to add promotional contents and video contents. Since it is an HTML5 based website template, you can easily add videos and video links to this template. At the top, you have space to add user login and register option. Since it is a free template, you have to take care of the login and registration forms by yourself. By making a few adjustments to the design, you can easily use this template for any type of websites. 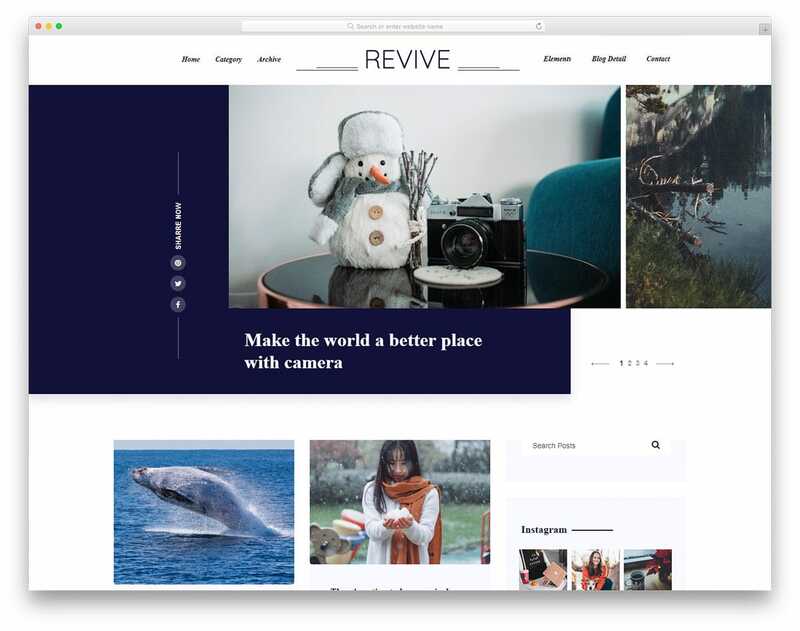 Revive is primarily a magazine website template. Since it is designed to handle multiple contents and all types of text & video contents, you can use this one for your gaming website. Sidebars are given in this template to let you add related contents and ad banners. If you are an upcoming gaming website, the default features are enough. Even if you need additional features, you can easily add them in this template. Since it uses the latest web development frameworks, you can integrate any modern tools and application to this template. To provide better readability the designer has used a clean white background. 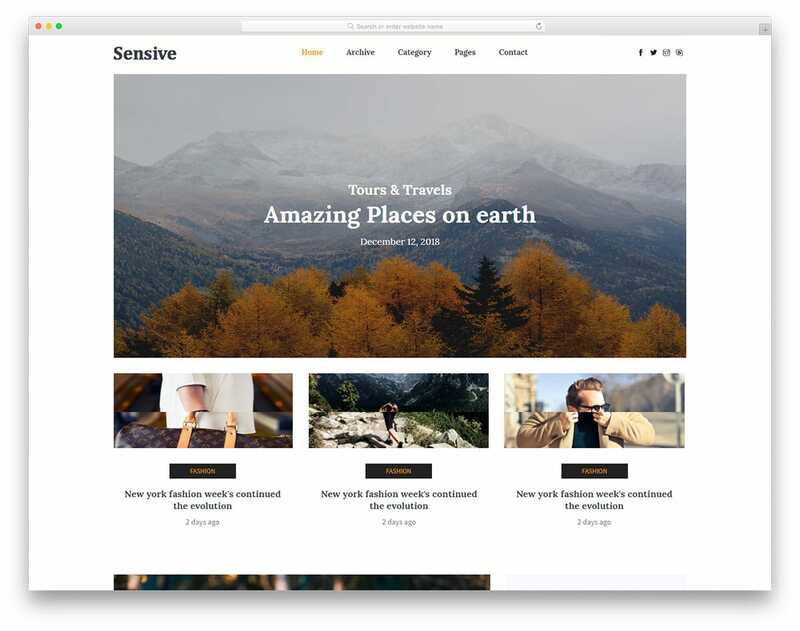 Sensive is a properly organized website template. All the contents are neatly arranged so that the user can easily find the contents they want. Images are used to indicate the categories. If you are making original images for your posts, this image focused homepage will be very handy for you. Smooth carousels are used to show multiple contents in one place. In the single post page, you can see that the designer has given you all blog related elements to present the contents engagingly to the audience. In the footer section, you have space to add a social media widget. If you are running an active Twitch or Youtube channel for your gaming website, these social media widgets will come in handy for you. If you wish to use the entire screen space effectively, this is the template for you. 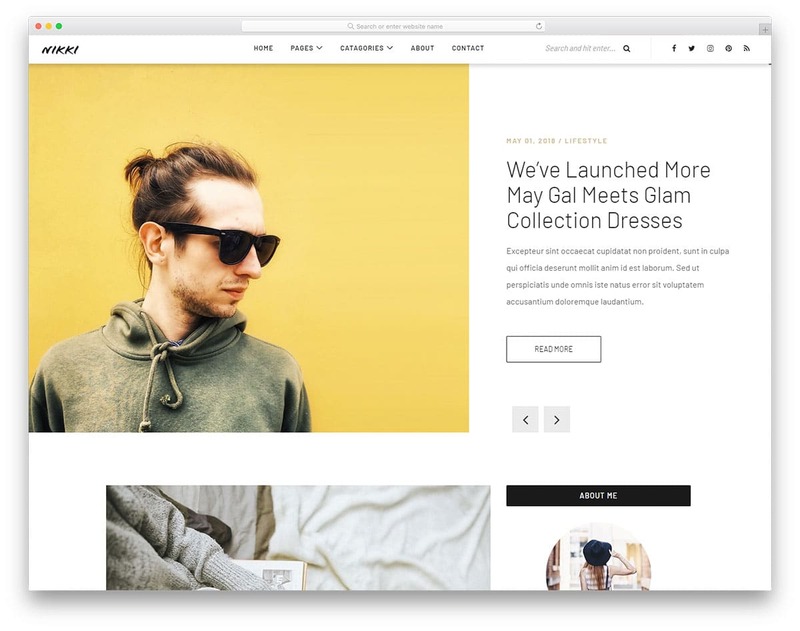 The designer has used a full-width layout in this template. Big images and texts are used effectively to make use of the full-width layout. Colorful tags are used to easily identify the categories. Simple and elegant looking animation effects are used on this template. Fonts are chosen with care so that the user can easily read the contents. Since it is a mobile responsive website template, the selected fonts are legible even on the small screen devices as well. Though there are no video contents in the demo, you can add video contents to this template without any issue. Techmag, as you can see this is a portmanteau word for technology and magazine. Since it is a magazine website template it can handle multiple contents elegantly in one place. Modern web elements and visual effects are used to present the content engagingly to the users. 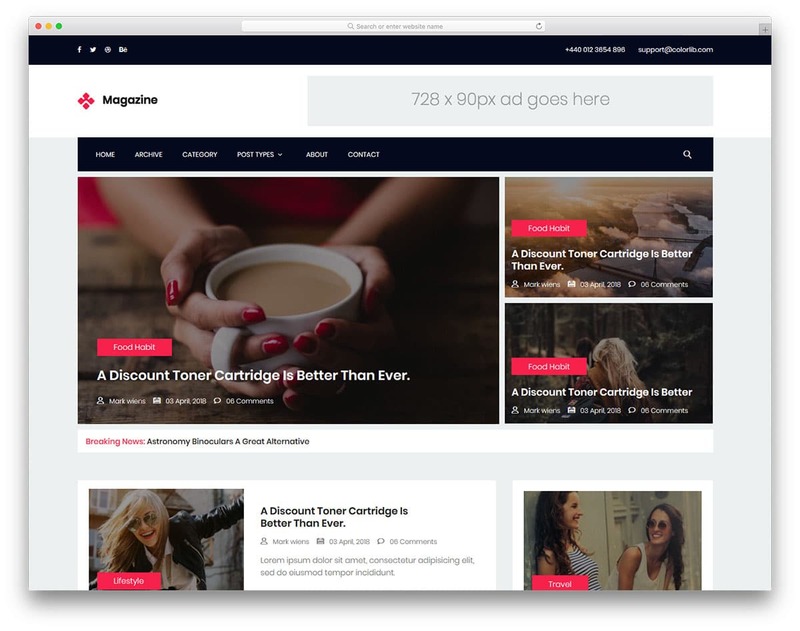 The creator of this template has also thought of ads so that you can monetize your website easily. In the header, you have an image slider with bold texts and call to action button to feature the latest contents. The top bar gives you space to add social media profile links and subscription button. Since this template uses the ajax based continuous page loading, you can keep the users for a longer period of time. Ample amount of space is given for the images and text contents. This template is the best option for both game review website and news website. Qitelight is a quietly brilliant website template. This template includes all the modern web elements to present all types of contents. If you are covering everything from news to video review, this template is the best option for you. Content blocks are throughout the homepage to help you add any type of contents. Carousels and big banners are used to highlight the featured contents. In the demo itself, you can see video contents added in the featured content area. The right sidebar is totally reserved for adding recommended contents and image banners. 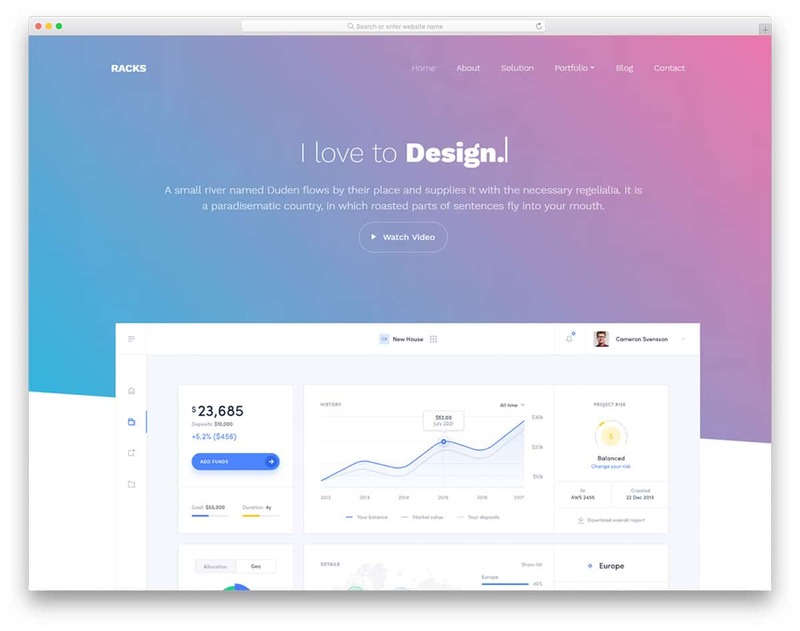 You can use this creative homepage design in your existing website template project or you can build your own using this. This template uses the latest HTML5, CSS3, and Bootstrap framework. Fonts are also selected artistically to add visual richness to the template. In the download file, along with the template, you also get the fonts and images used. So you can edit this template easily. 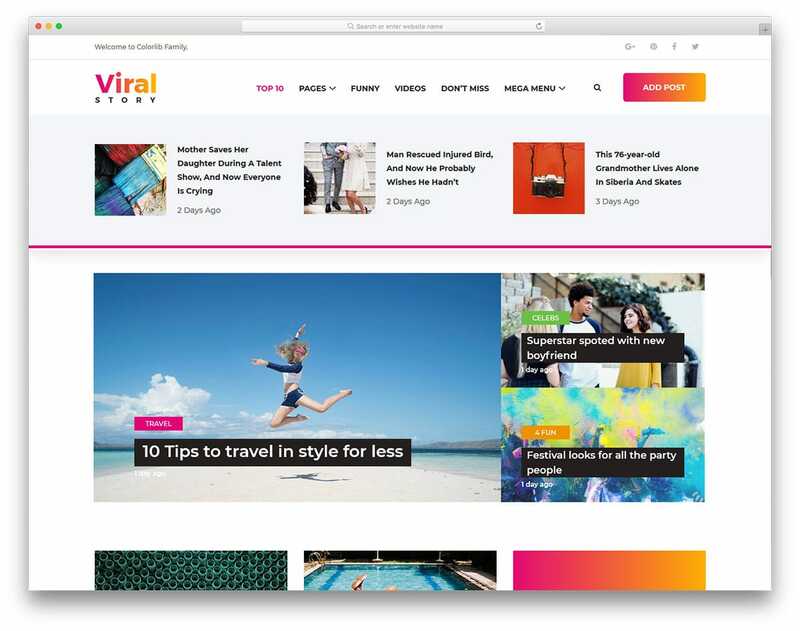 Viral is a lively and colorful website template. With the colorful gradient color scheme, this template gets user attention as soon as they land on the site. Featured content blocks are given right below the header section to highlight the top stories. Tags of different colors are used to differentiate the categories elegantly to the users. If you are building an online gamer community, this template is the best option. In the top bar, you have the option to include “submit post” call to action button. Other gamers can share their gaming videos or discuss the upcoming game. Take a look at our admin template collection to easily manage all the users and moderate their post. If you are planning to make a CMS version of this template, you can do it easily. As this template follows the code standards followed by professional web developers, you will find this template easy to work with. 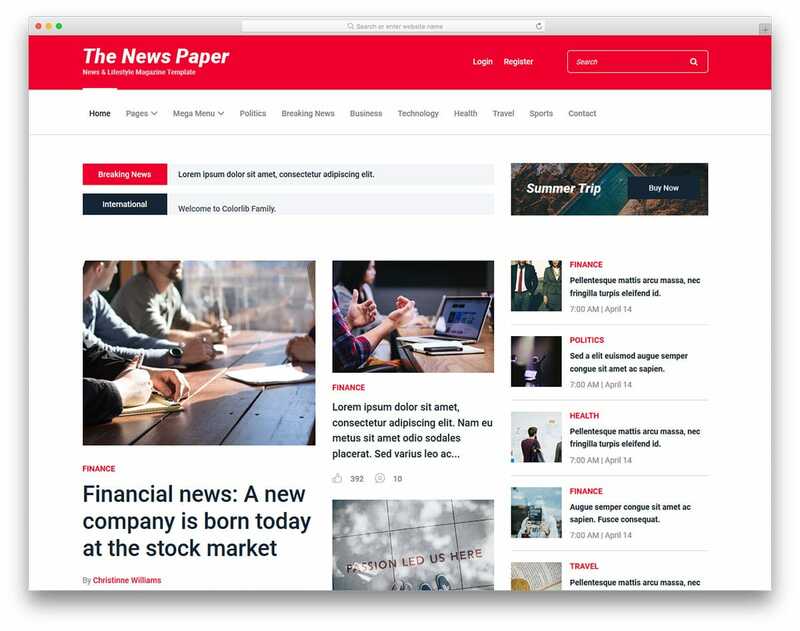 Newspaper as the name implies this template is designed for news websites. With a bright color scheme and flashy web elements, this template helps you to elegantly promote important contents. Neat segmentation of this template makes it a perfect option for the gaming website. You can neatly cover different categories and the user also can easily find the content they need. In between sections you have space to add youtube videos, to share your gaming videos and also to improve your number of views. Even if you are live streamer in twitch you can add your video in this template. As it is an HTML5 template you can add video contents and other multimedia contents without any worries. On the homepage, you can show the number of comments and likes for a post to encourage the news readers to see the post. 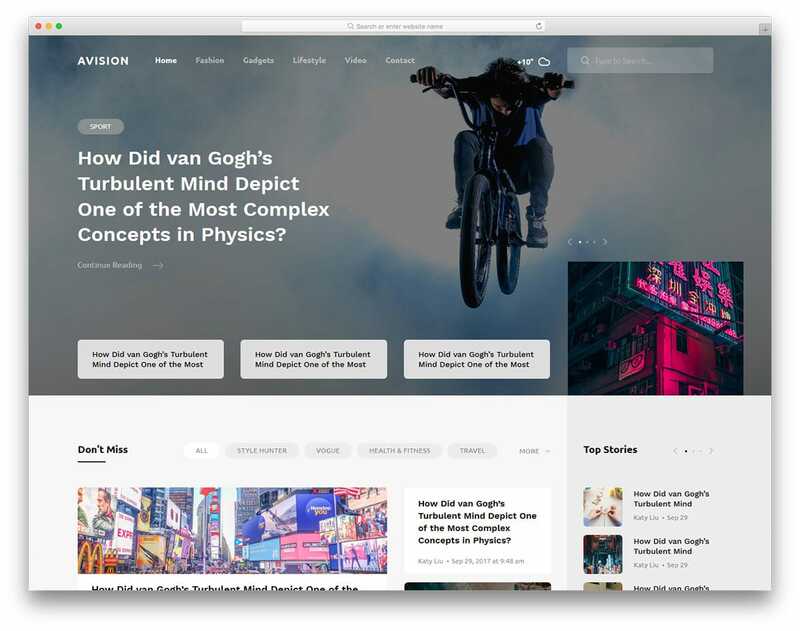 Avision is almost similar to the Quitelight template mentioned above. This template has all the elements which modern users prefer a lot in their media consumption. Big image holders let you put images of higher resolution and of any orientation without any worry. Modern content blocks help you to present the contents elegantly to the users. 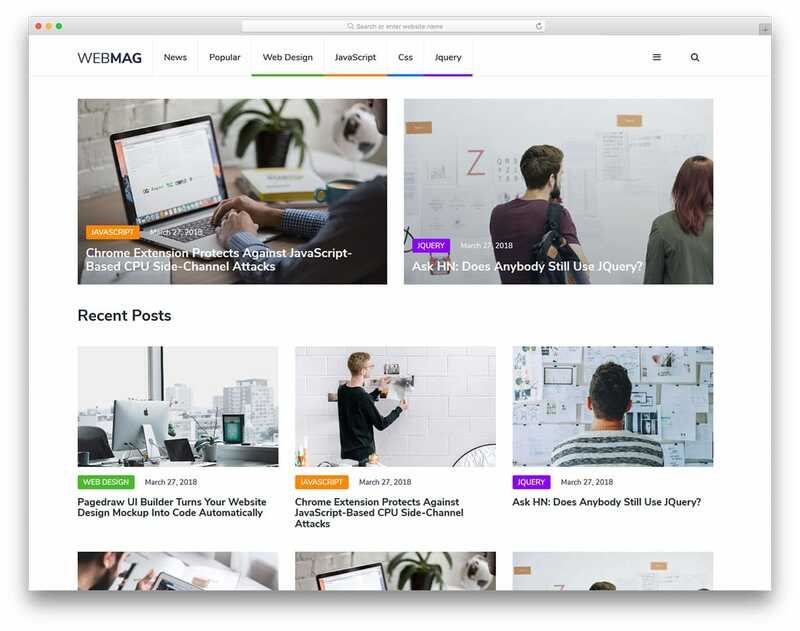 With this template, you get both homepage design and single post design. For category pages, you can use the simplified version of the homepage or you can use your own custom design. Carousels are also given in the sidebar to help you put more contents within the given space without disturbing the look. Visual effects are mild and are used only at the required spots. The footer section is made simple, where you can add only social media profile links and subscription form. 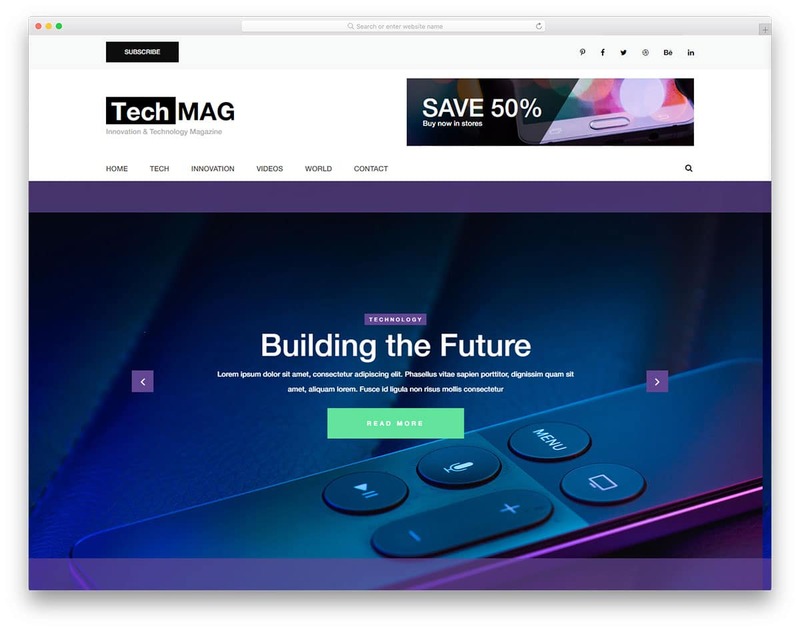 Magazine is a well-optimized website template. The creator of this template has given you all the elements to run a commercial blog. Ad banners are provided at the optimum positions to improve the impression rates. In the homepage, for each category, you have featured section to highlight the best post for that category. If you are covering different types of gaming contents, this neat segmented homepage design will help you a lot. This template includes both homepage and subpage designs so that you can set up a new website in no time. In all the subpages you have a flash news element just below the header section to keep your readers updated. Instagram is one of the biggest and effective social media for the gaming industry. In the footer, you have space to add an Instagram widget. 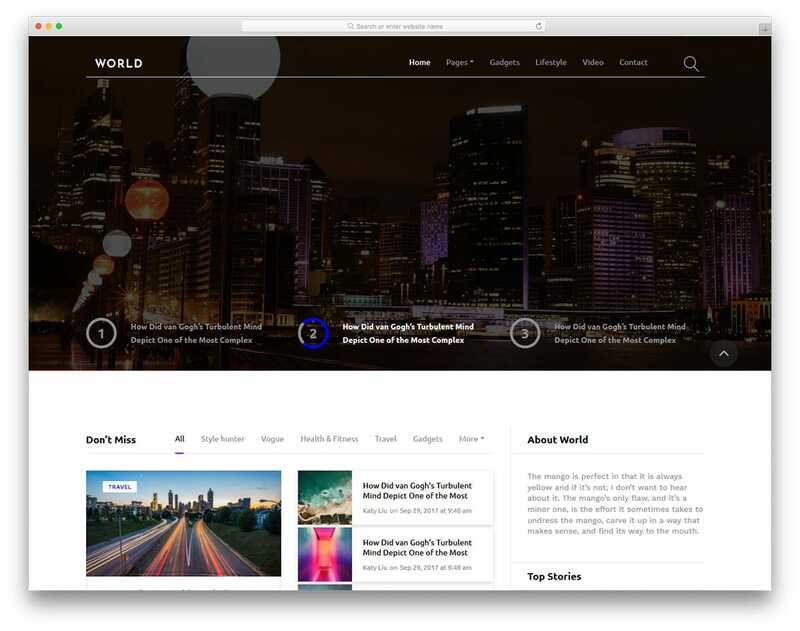 World is a perfect website template for content-rich websites. If you redesigning your existing website or making a new design for a daily active site, this template is the best option. The creative web elements of this template help you elegantly display any number of contents. Visual effects are also used smartly to present the contents engagingly to the users. Under each category, you have a tabbed interface to present more contents. Carousels in the homepage change automatically to the website live and also to draw user attention at the particular content. Both regular page and main post pages are given in this template to help you easily add the content. Even the comment section in the post page is taken care so you can give a clean environment for the readers to interact. From the blend word title itself, you can clearly understand that this template is designed for both news and magazine websites. Big sections and image-holders help you to give a lively feel to the content. On the homepage, you have content blocks of different sizes to genuinely highlight the latest news from the other contents. In the top bar, you have quick user links like about, privacy and user login. This template does not include login form design but never worry. We have made a complete list of login form templates with cool designs, take a look at it for your website. The footer section in this template is also made big enough to put important page links and widgets. In the demo you have widgets for twitter feeds and Flickr, you can use Instagram instead of Flickr. This template is completely flexible for adding any type of modern API. 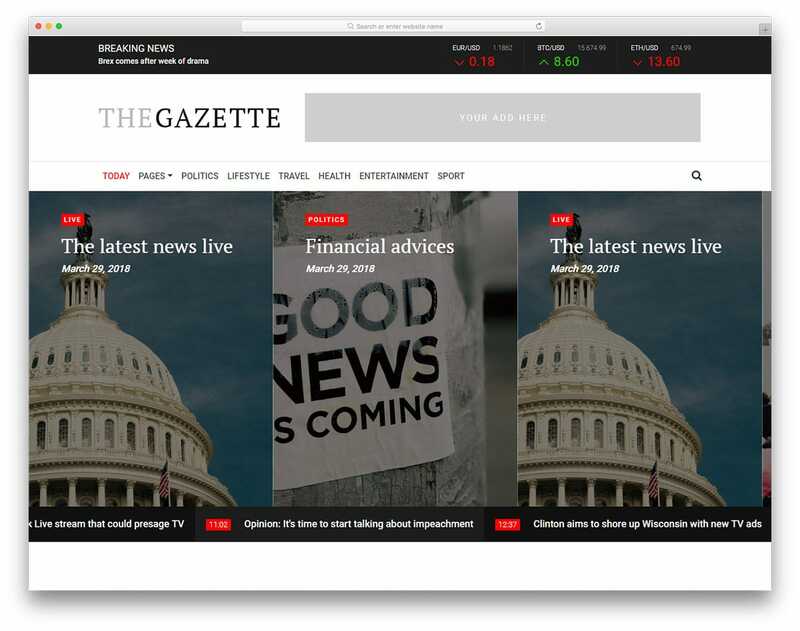 The Gazette is a pristine clean website template for active 24×7 channels. If you are making a website for a big gaming community or news website, this template is the best option for you. Clean design and ample amount of space between each element make interaction with this template easier. Both the desktop version and mobile version in this template is easy to use. Ad banners are given in all the web pages to improve your monetization rate. In the header section, you have image slider with regular square sized image holders. In each category, you have space to add video contents as well along with the text contents. Since it is a business based news website template, you have a stock market live update at the top bar. You can use the top bar to show the upcoming gaming events and game launch. Foode is for influencers and personal gaming website. If you are sharing your thoughts and gaming experience with your audience, this blog template can be used. Since this template is designed for personal use, it has plenty of personal brand-boosting elements. In the sidebar, you can add an about section along with your social media profile links. Though this template is developed for a food blog, you can use this template for your gaming blog and game review websites. This template includes both drop-down menu and mega menu option so you can provide better navigation experience to the users. With this template, you also get other subpages for about, contact and single post. 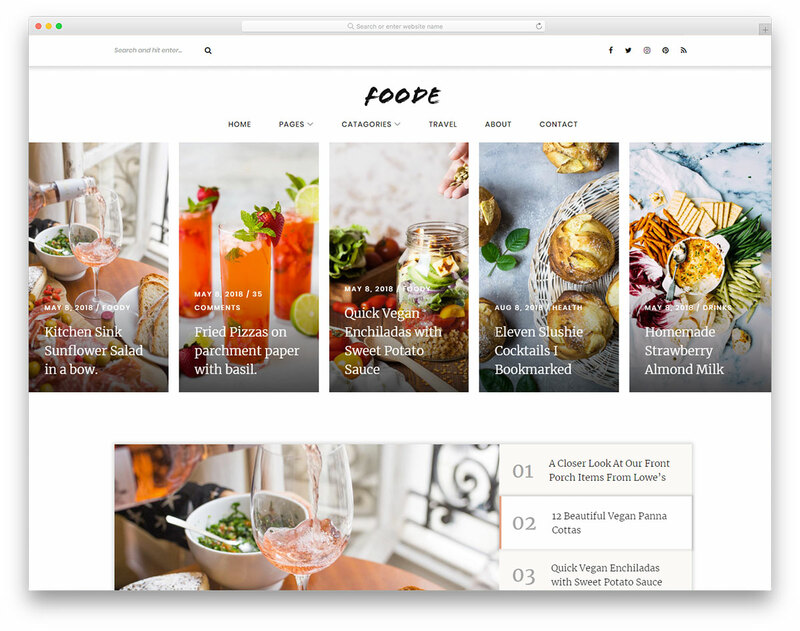 Since it is a food blog template you have big image holders, and options for adding video contents, to explain the content engagingly to the users. 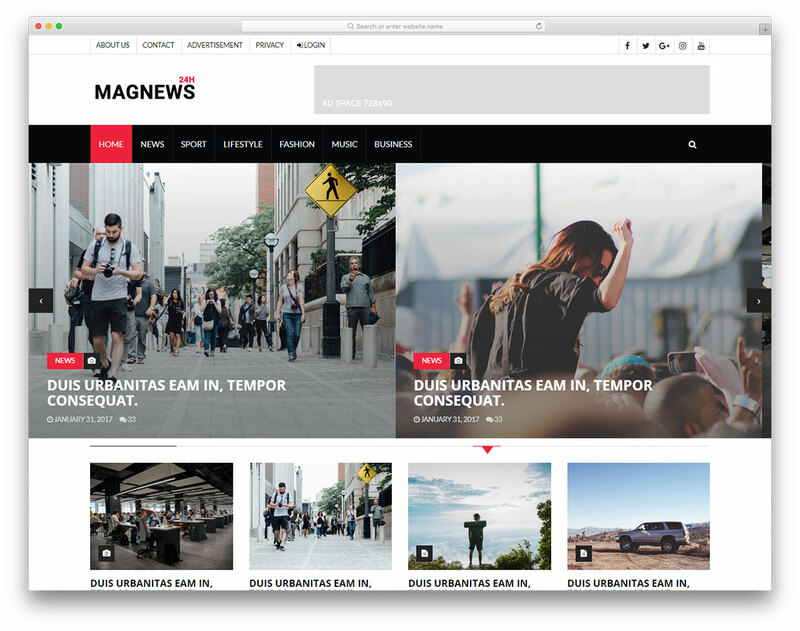 Web Mag is a pristine and clean looking website template. If you are more into the text type contents, this template is the best option. Neat segmentations and ample amount of spacing between each element help you to display many contents in one place. Each category follows a color code and the menu bar at the top also show the related colors. Image holders of all sizes are given on the homepage to help you elegantly highlight the important contents. Font selection is also done with care in this template. The texts look clean and easy to read even in small screen devices. In the single post page, you have social sharing options to the left to increase the audience reach of your content. Nikki is the best gaming website template for gaming bloggers and influencers. This template has elements to boost your personal branding. The creator of this template has given you space to add all types of contents. You can entertain your audience with walkthrough videos, podcast audio, and direct blog post. Ample amount space is given in the sidebar and main content area to help you add your sponsor links and banners. Animated images in the image slider give a lively feel to the template. Another useful feature in this template is the mega menu option. If you are covering more than one category, this mega menu option will help you organize the link in one place. The designer of this template has made this one a social media friendly template. You get plenty of social media sharing links and spots to add your social media profile links. In the single post page, you have related post section and social sharing options to help your content reach larger audience base. A full-width Instagram widget is given in the footer section of all the page to help you increase your Instagram followers count. 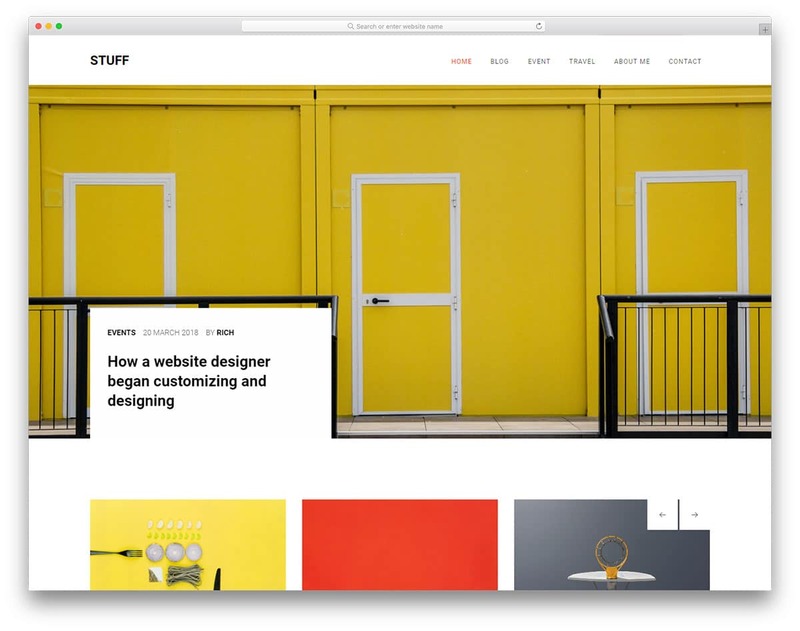 Stuff is a modern website template with a versatile layout for both blogs and magazine websites. To help you add more contents and also to add any type of contents, a content block design is followed in this template. The smart content blocks help you add images, quotes, and image slider. If you need you can add video symbol for the video posts, just like in the CNET mobile news application. 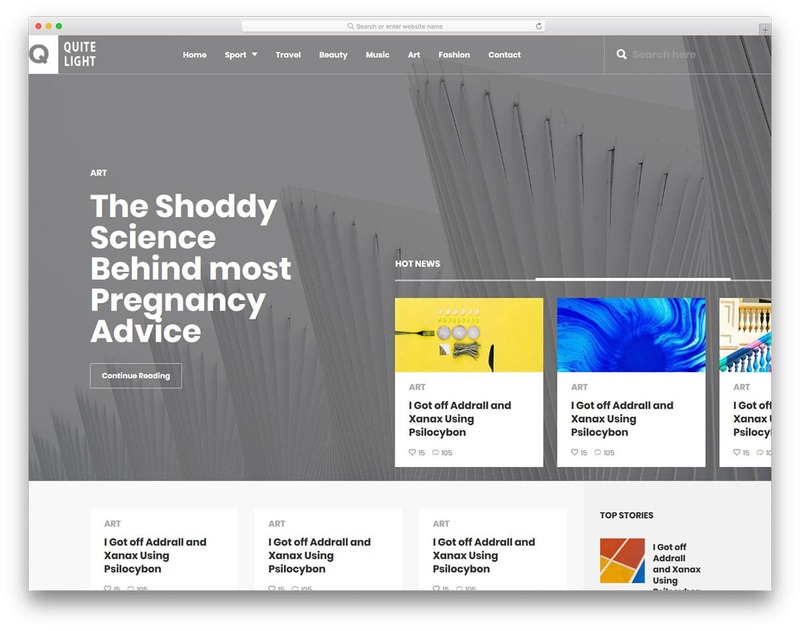 Cutout like design is followed in the homepage to help you add the post title and neatly highlight them. An image slider is given in the home page to help you feature the most important posts and contents. Showing author bio is one of the important criteria Google uses in its SEO ranking, with this template you can clearly show the author of the post. Masonry style grid design with lots of white space helps you to neatly show more contents in one place. Pagination is followed in this template, if you need ajax based loading, you can use it as well. This template uses the latest HTML5, CSS3, and Bootstrap framework with industrial code standards. So customizing this template will be easy for the developers. 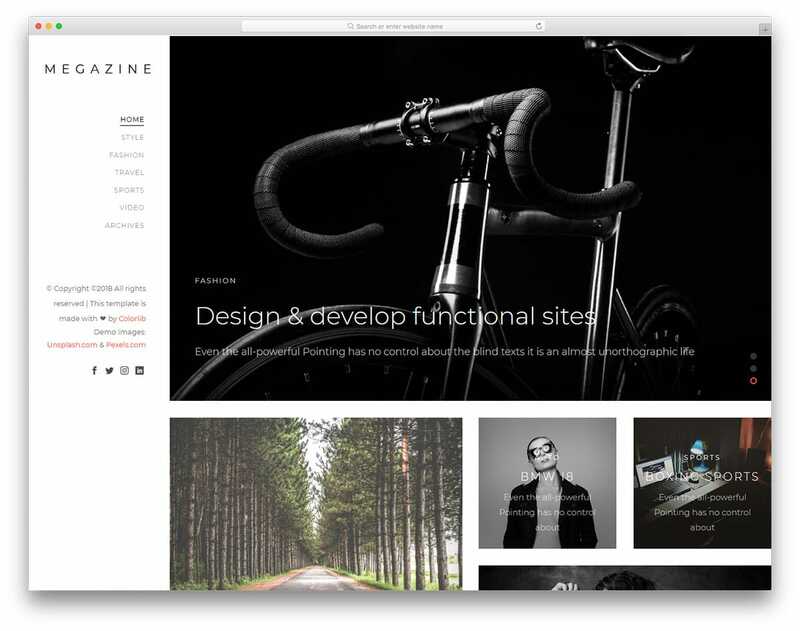 Megazine is a modern website template for entertainment sites. The left side of the template is reserved for the navigation options and logo. Placing the logo in the sticky sidebar increases the chances of your brand visibility on your website and also helps the user to remember your brand. 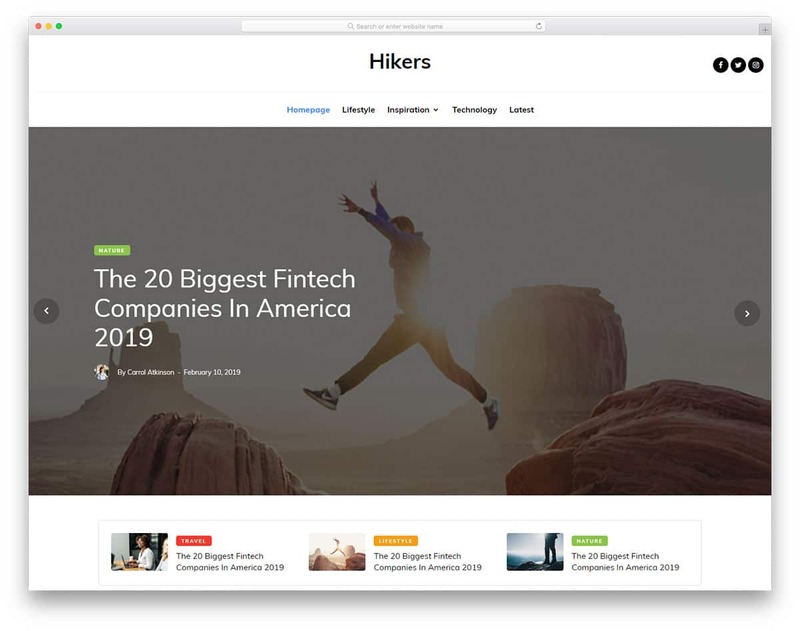 The homepage of this template uses grid-like design with most of the space reserved for the images. Letters are made bold and crisper so that you can see the texts even on the images. Even though in some bright and light color images, the texts may not be visible. So check it twice before setting your blog post featured image. In the sticky sidebar, you also have space to add your social media profile links. If you are an upcoming gaming website, this template will help you make a strong foundation. 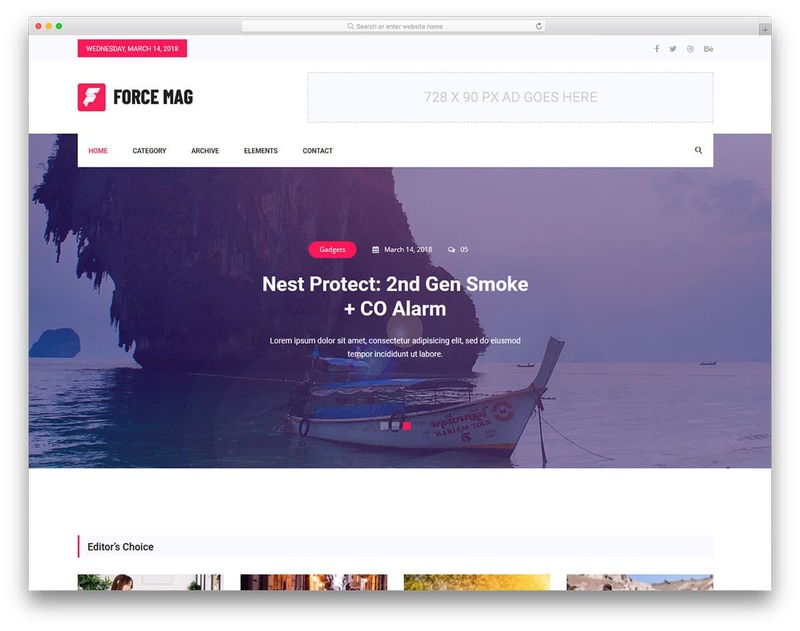 Force is a bright and clean looking proper magazine website template. As you have seen in many magazine website templates, this one also gives you space to add both images and texts. Spaces for ad banners are already given in this template. The best of the ad banners is the designer has placed them in the most appropriate position where you will get more impressions. In the top bar, you have space to show date and social media profile links. The date widget given in this template is for demo purpose, you have to manually take care of it if you need it in working condition. In all the subpages you have a big image banner in the header section, which you can use to show related images or promotional contents. The footer section of this template is made big enough to add all important page links and a short bio. You also have a recent news widget in the footer to keep the users updated. 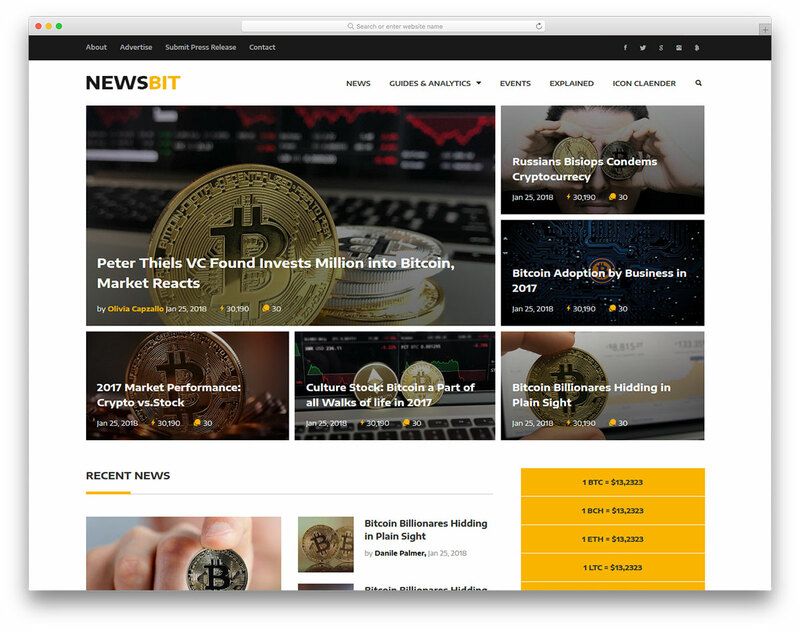 Newsbit is a blog and magazine website template for financial websites. But you can use this template for the gaming websites as well. In the homepage, you can show the number views and comments for each post to encourage the users to read a particular post and also to easily find the trending post. A grid-like design is followed in the header to help you easily highlight the important contents and trending topics. It is a one-page template, you can use this template homepage for your existing project or develop your own custom template. This template uses the latest HTML5, CSS3, and Bootstrap framework. The developer of this template has made it easy to customize so the developers will find this template easy to work with. 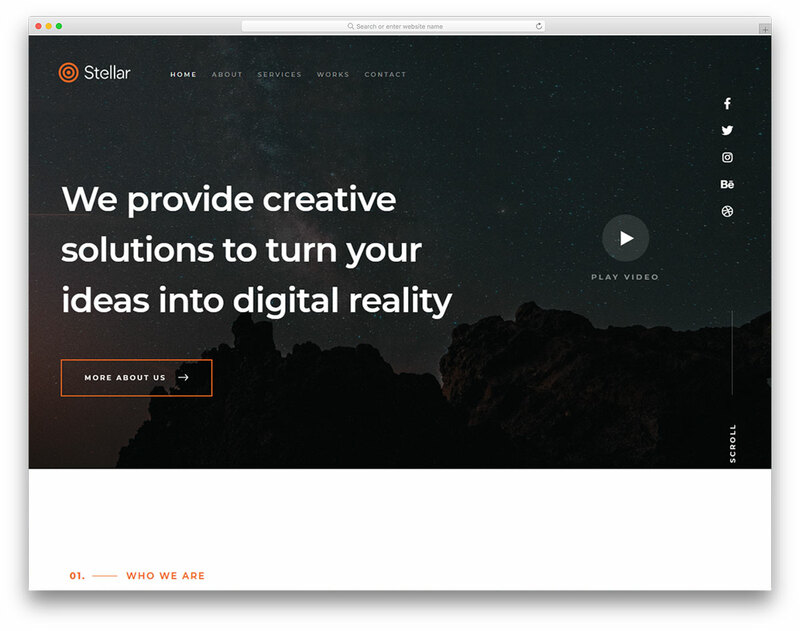 Stellar is a perfect business website template for gaming related businesses. The creative design of this template helps you to attract a modern audience. Since it is a business website template you have plenty of space for text elements. Fonts used in this template are professional looking and also give an artistic look to the template. If are a startup and looking for an easy to maintain website template, this is the one for you. Since it is a one-page template you can explain all your games in one place. This template also gives you space to add video contents to show a preview of your game and your team. A gallery section is given in this template to help you showcase some of your gameplay screenshots and trailers. 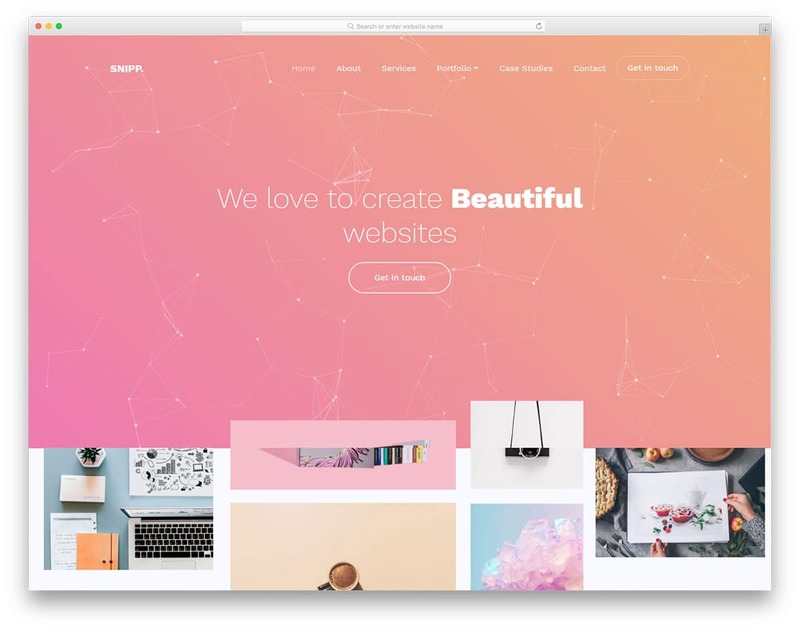 Snipp is a lively website template with animated particle background. If you are a mobile game developing websites, you can use this template for your games. It is a multi-page template so you can use this template for your main business website as well. Trendy lightweight fonts and cool colors make this template meet the present-day audience taste. A call to action button is placed in the top navigation bar, which you can map it to your game download page. The large footer section helps you add a short description about you and other important page links. You also have space to add social media profile links. Staying active in the social media help your users to stay in touch with your easily. In the demo version, you have the live particle background in all the subpage header section, but if you need you can change it to the way you want. Racks is a modern website template for creative software companies and SAAS companies. You can use this template for your gaming business website. In the header, you have a typography animation to give an interactive intro of your game and your business. Since this template is designed for SAAS companies, you have plenty of space for adding your screenshots. Instead of using a regular parallel line sectioning, the designer of this template has used tilted lines. Not only the tilted lines, this template has lots of creative elements, which makes this template a perfect option for gaming websites. Smooth scroll effects are used in this template to present the contents engagingly to the users as they scroll down the web pages. If you are making minimal artistic games, then this template will reflect the style of your game. 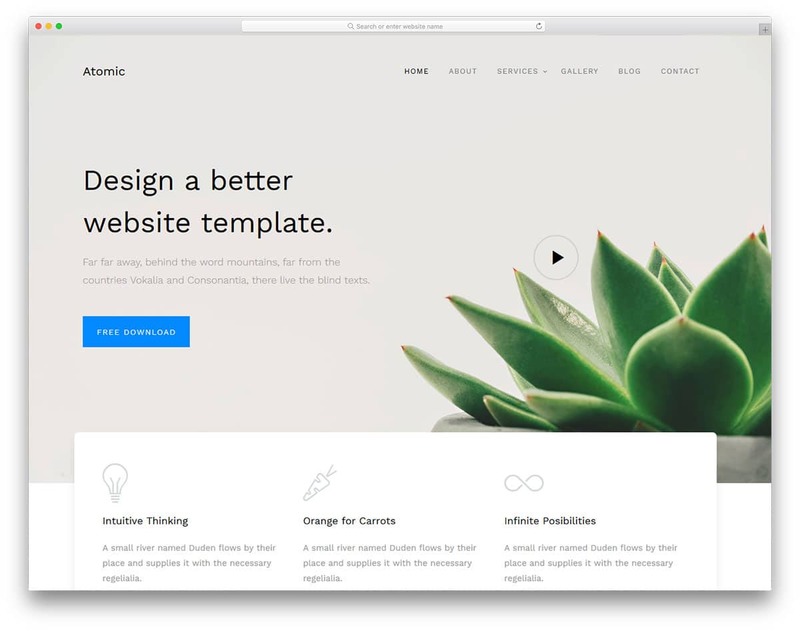 The Atomic is a pristine and simple website template, which gives a distraction-free environment for the visitors. Call to action button to download game is given in the footer section to help the user easily find your games on the Appstore and Playstore. Line vector icons are used in this template to explain the features. You can even use the icons to show your achievements. If you have your own color scheme, you can customize this template to your need. This template uses the latest HTML5, CSS3, and Bootstrap frameworks. So this template can handle modern colors and effects easily.